Right now I'm on a train together with my girlfriend Hedvig. It's hot, no air conditioning and people are coughing and small kids are screaming and crying. Well, we are trying to survive. 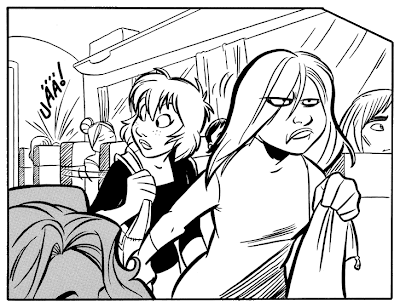 And it just happens that the latest Emma & Sara (written and drawn by Hedvig) has the same theme. E & S are faced with screaming kids, a coughing lady and a punk kid who plays loud music on a train. 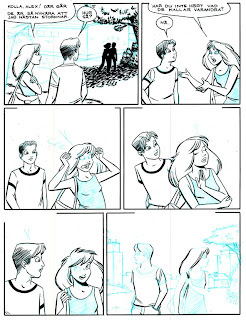 Here are a few panels. The page has been sent to the colorist and will appear in Julia 17 this year. 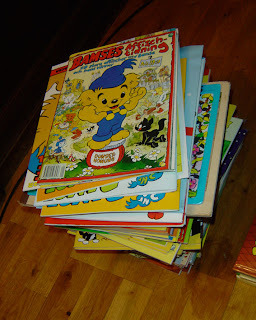 Today we photographed all the bonusmaterial for the upcoming BaBa book. 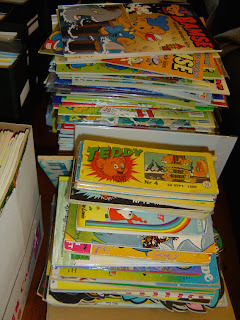 The preface is also beeing written and some missing strips is beeing searched for etc. The book is slowly progressing but I think it will be finished in time for the bookfair in Gothenburg this autumn (September). 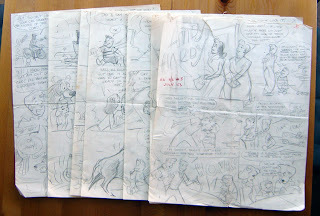 Until then, here are a few pages from Rinaldo's BaBa sketchbooks. 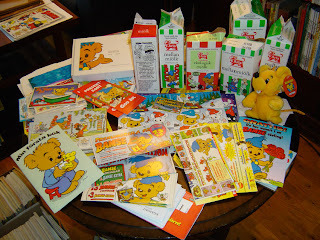 Over the years he filled 63 of those. 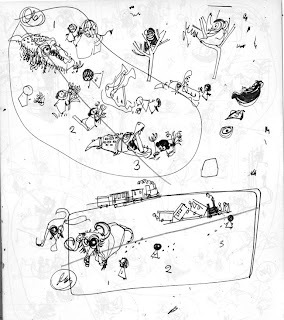 All featuring germs of ideas for BaBa strips and more finished gags. 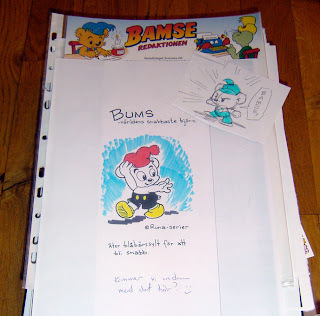 These sketchbooks were the place where the strips were born. 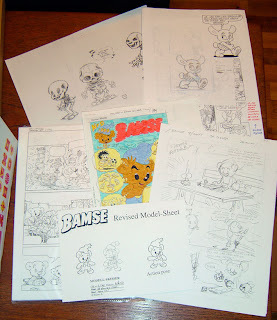 It's facinating to be able to follow the creative process by looking in these sketchbooks. 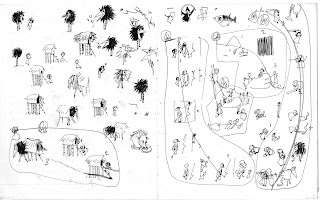 There will be a few pages in the BaBa book but not as many as I wish there could be. So here are a few from sketchbook 60 for your enjoyment. There's a brand new Elsje album out now! Edit: Here's small teaser for those of you not familar with Elsje, and for those of you who can't wait to get the book. 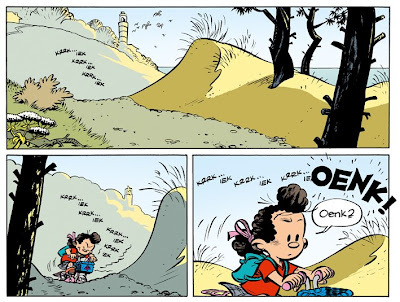 More on Elsje, including a few strips in English, can be found on this blog if you click HERE. Following yesterdays Terry – here's Teddy! 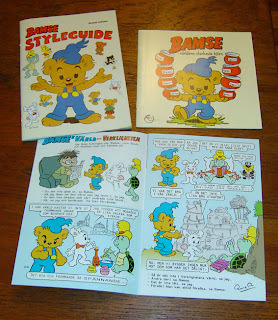 Teddy was a comic about a bear and his two friends Skalman and Lasse Skutt, a turtle and a rabbit. 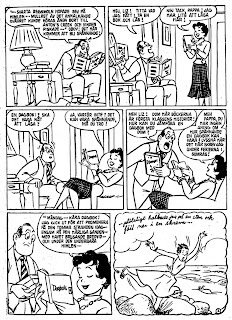 It was written and drawn by Rune Andréasson in the 50's and early 60's. 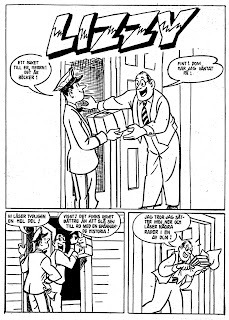 Teddy appeared in a few albums, in the comic book "Tuff och Tuss" and in his own comic book 1959-1960. All of that is common knowledge for fans of Rune Andréasson here in Sweden. 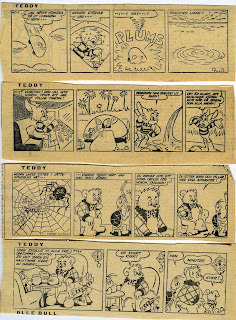 Very few knows that Teddy also had his own daily strip! 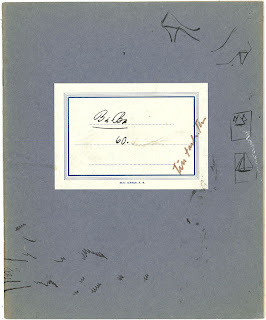 I had never seen any examples until I ran into a stack of originals in the Andréasson archive. 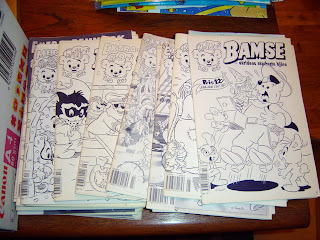 I guess that the strip ran in just a few papers, so it's hard, if not impossible, to find any tearsheets of it at all. I have no start or end dates. Further research needs to be done. 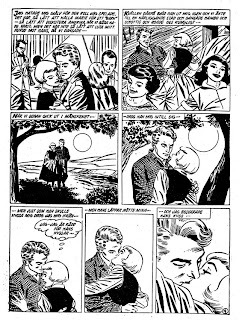 Just to show you something here are five strips that I found among some papers and tearsheets that I have on loan. Enjoy! Anyway, I saved the image and thought I should share this nice George Wunder drawing with you. Apparently it was sent out to fans in the mid-late 40's and part of it might be hand tinted. Enjoy! A few weeks ago I picked up a scribbled script for a 1953 Andy Hardy story. 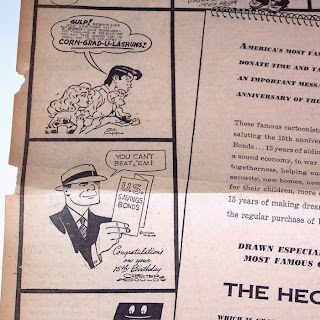 Andy Hardy was produced by Western, the same company that produced Donald Duck and Woody Woodpecker and had artists like Carl Barks and Paul Murry as freelancers back in the 50's. 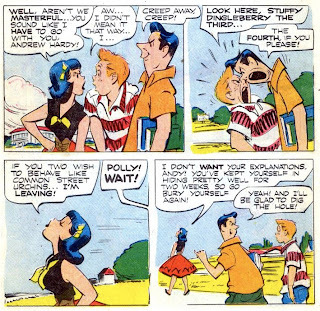 Now, the artist responsible for the artwork in the issues I've seen was Al Hubbard. 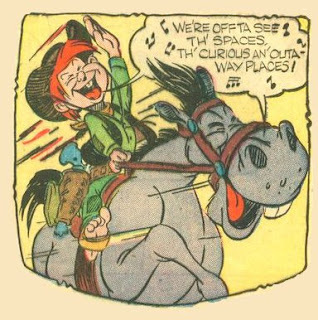 The artist behind "Scamp" in Walt Disney's Comics and Stories. 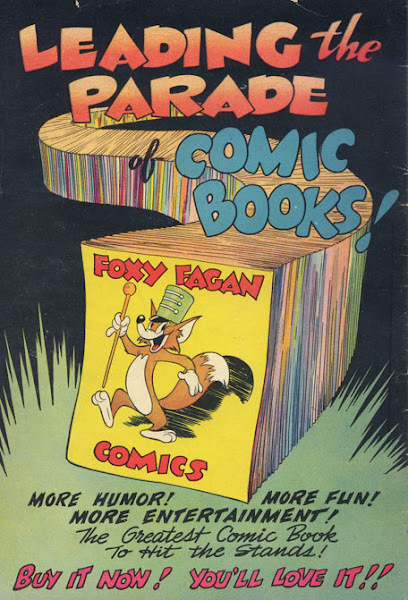 He also did the best version of Fethry Duck for overseas publication and "The Adventures of Peter Wheat"and "Mary Jane and Sniffles". 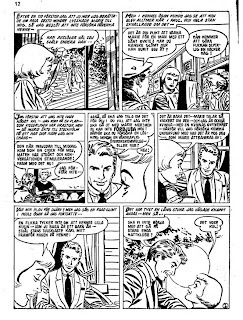 While I don't have a copy of this issue of AH yet (I'm waiting for it to arrive from the states)I suspect this script is also done by Hubbard. Or does anyone have any suggestion who the writer might be? As soon as I get the published version I'll post a page by page comparisation between the script and the finished comic. 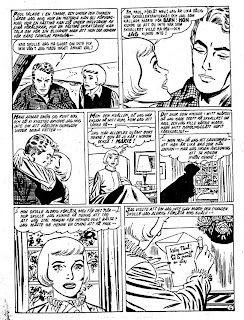 The same issue of Vicky that had the "Kalla mig inte älskling" story also had this wonderful "Lizzy" three pager. 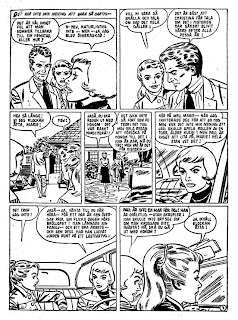 The style is so fluid, charming and appealing that I suspect Owen Fitzgerald is behind it. Please enjoy! PS. 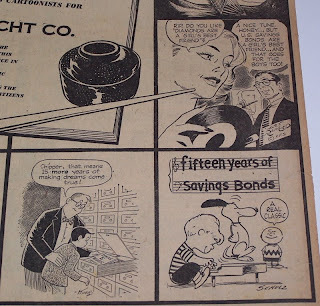 I just learned about a tribute site to animator/comic artist Jack Bradbury! 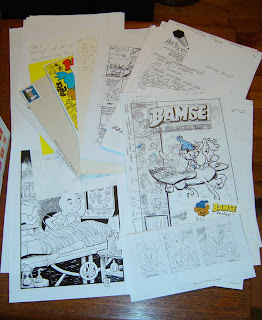 http://jbrad.org/ Lots of comics, sketches, letters etc. Go check it out! 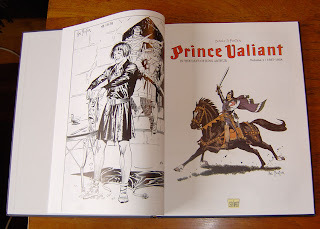 I just got a fantastic edition of the first two years of Prince Valiant from Portugal! 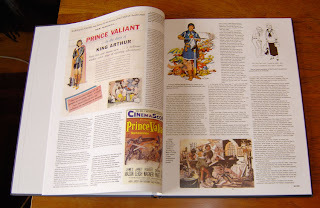 Every page has been reproduced from sharp proofs or carefully restored from the best scource material available. It should be noted that even though this is published in Portugal the book is entirely in English! This is really the way I've always wanted a PV edition to look! To get a copy if you live in Europe please order from Manuel Caldas (The publisher) or try The Book Palace in UK. 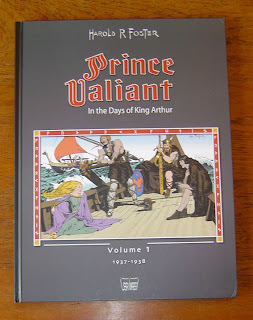 If you live in the USA it's available through Fantagraphics Books. The publisher of this black and white series are still looking for a number of proofs for upcoming volumes. So if you have any or even nice copies from proofs you should get in touch with him. Or if you know someone with access to proofs. 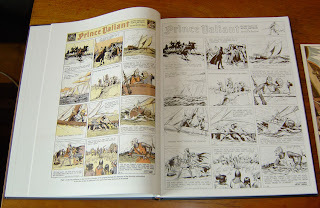 That way we can make sure this will be the best possible edition of Prince Valiant in black and white. PS. This was published last year but I didn't know about it until now. And it seems that very few collectors knew about it until very recently. So please spread the word about it so the publisher can continue this project. Never seen any of these images before. 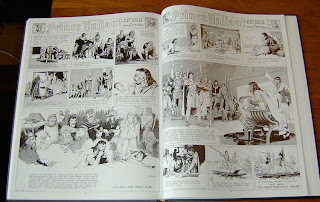 Caniff, Schulz, King etc. I hope IDW can get hold of a good scan of Raymonds piece for their books. 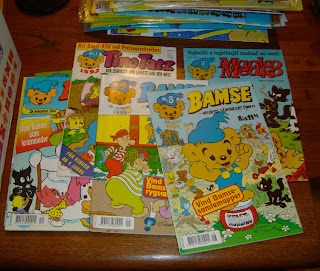 First we have some photos of mixed Bamse comic books and albums. Some rare items and some common. 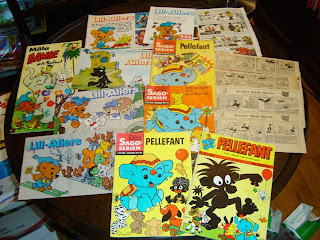 Then some foregin editions. 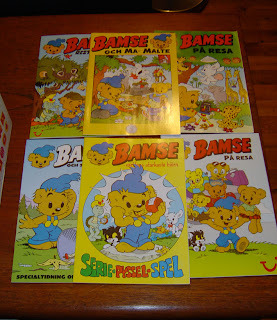 Notice that these sometimes have variations of the Swedish covers or covers not used in Sweden. Some odd and rare stuff. Back in the 90's, before web approval and digital printing we had to approve black/blue and white preview copies like these. I kinda miss them. They smelled so heavy of chemicals that you could get a headache though. I guess these are the only surviving copies. 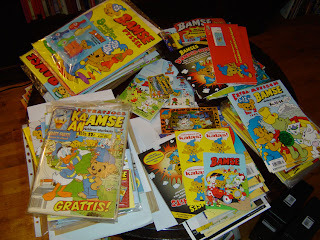 To finish this post some Rune Andréasson (The creator of Bamse) oddities that I've bought over the years. 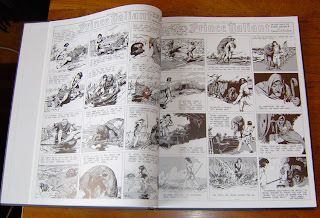 Remember the E Simms Campbell illustrations I posted a few days ago? I thought the one with a woman in a bathtub looked familiar. 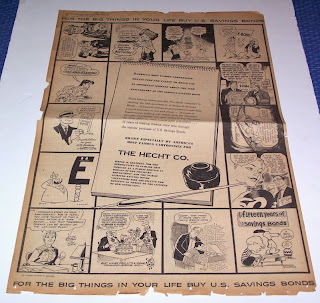 And now I've found the Alex Toth illustration I was thinking of. Just take a look at the photo below. I guess Alex saw Campbells artwork in Esquire and did his own "version" of it. 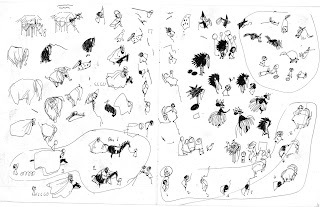 BTW: Was Alex artwork printed anywhere before it appeared in Manuel Auads "Black & White" book? It's sunday and a "do this and that" day. 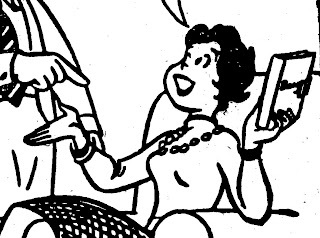 But right now I should finish inking an E&S page. Not much left. Here's the page in it's current state. The finished version will appear in the Julia magazine #16/09 in early August. Click to enlarge. 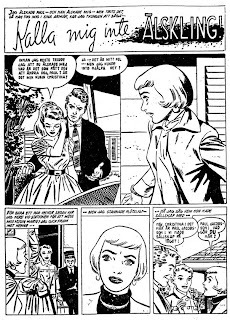 A few years ago I was browsing through a stack of old romance comics from the late 50's. 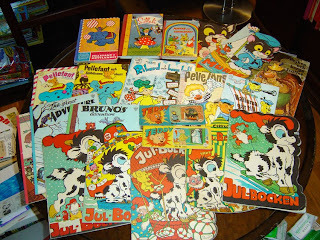 Here in Sweden there was a comic book called Vicky wich used american comics and ran them in black an white back then. Most of the stuff I saw was pretty uninteresting but there was one story that really stood out. 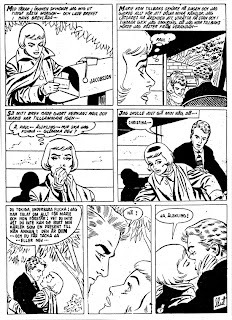 I don't know who the artist is but it sure is made under the influence of Alex Toth. 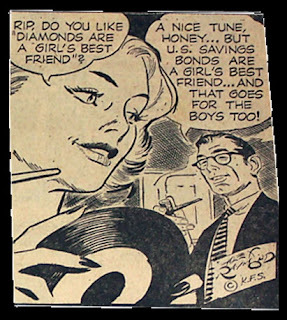 Maybe it's Dan Spiegle? 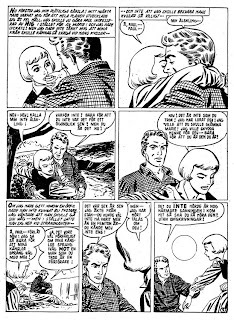 Just look how well composed the panels are and how the artist use black as a contrast.